As a Licensed Insolvency Trustee, my clients tell me how difficult it is to live on minimum wage. That’s why they often have no choice but to use debt to survive. 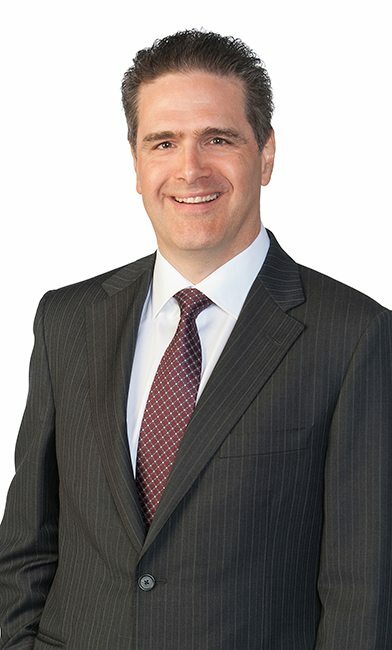 I know that the average person we help file a consumer proposal or bankruptcy has an income that is almost 40% less than the median income in Ontario; in many cases our clients are working minimum wage jobs. My clients don’t have a debt problem; they have an income problem. A living wage is the hourly wage a worker needs to earn to cover their family’s basic expenses within their community. The minimum wage is basically the same across Ontario, whether you work in downtown Toronto or a less expensive small town, and it is not in any way related to what it actually costs you to live. 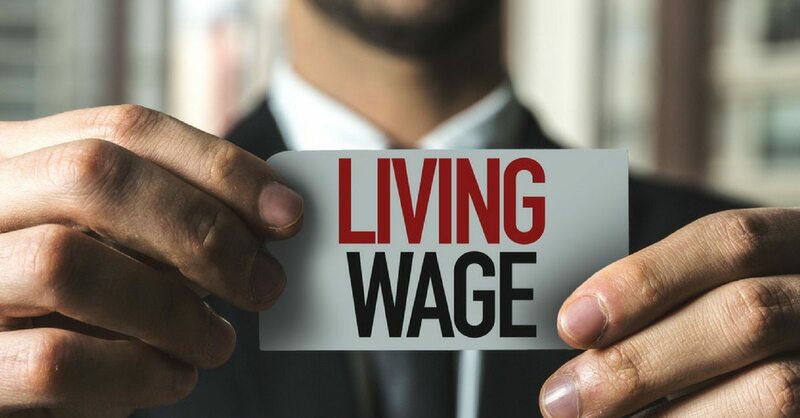 A living wage is calculated for each community, based on actual living expenses, so the living wage in will vary from city to city, based on actual costs. For 2017, the Living Wage in Kitchener is $15.42 per hour, which is higher than what the minimum wage will be in 2019. Clearly, the minimum wage is not a living wage. Minimum wage just isn’t enough. I recommend that, instead of trusting something as important as wages to the government, each of us should use our purchasing power to support businesses that agree to pay their employees a living wage, and not simply pay them a minimum wage. If even a fraction of a business’s customers were to stop dealing with a business that didn’t pay a living wage, every business would either pay a living wage or go out of business. Full details on how a living wage could work is discussed in today’s podcast. Debt Free in 30 podcast #114 with David Macdonald Basic Income: Is it a Silver Bullet for Poverty? Living Wage Waterloo Region: What is a Living Wage? Today I’m going to address a controversial topic, one where no-one is in agreement and where it’s hard to know who’s right. Today’s topic here on Debt Free in 30? Why in the world would I want to take an episode of a show that’s supposed to be about debt and talk about the minimum wage? Because debt and income are linked. People who have more debt than they can handle are often also the people who have lower incomes. We know this because of a study our firm conducted earlier this year that found people who have so much debt that they have no option but to file a consumer proposal or go bankrupt, also have incomes that are almost 40% less than the median income in Ontario. That’s a fancy way of saying that my clients don’t have a debt problem; they have an income problem. If they could earn a bit more, they may not have to rely on high interest rate debt, like payday loans, to survive. That’s one reason why many experts believe a higher minimum wage could solve a lot of debt problems. On May 31, 2017, the Ontario government announced that they are proposing the largest increase to the minimum wage in Ontario’s history, raising it to $15 per hour. As of today the general minimum wage is $11.40 per hour. Under the new plan the minimum wage is scheduled to go to $14 per hour on January 1, 2018, and to $15 per hour on January 1, 2019. So that means that in the space of a year an half, exactly 18 months, the minimum wage will go from $11.40 to $15, or just over a 31.5% increase. That’s a huge increase. What’s it like to live on the current minimum wage of $11.40? Well, if you are a single person, earning $11.40 per hour over a standard 37.5 hour week, your gross pay per week is $427.50 per week. I think we can all agree that that’s not a huge amount of money to live on. The consequences? Many people use credit cards and payday loans to pay for what their minimum wage job won’t cover. A higher minimum wage could help people stay out of debt. Let’s run some numbers. If you are making minimum wage, what does your monthly budget look like? So that’s $1,256 per month in livings expenses, which leaves you a cushion of $209 per month. So that’s sounds good, right? $1,465 in monthly income over a 20 day month is just over $73 per day. If you are off sick for 3 days, or if you don’t get called in to work for three days, you have lost all of your cushion. In fact, you are in the hole a few dollars. Can you find a place to live for $700 per month, where hydro and gas only costs $100 per month? That might not be possible. Can you cover all of your personal expenses, like food, and clothing, for $300 per month? In some months, sure, but if you have to buy a new pair of work boots or a winter coat, your cushion is gone. And what about unexpected expenses? Like medical costs? If you need to buy prescription drugs, there’s no room in the budget. And of course there’s nothing in the budget for entertainment, or anything else. I’ve given you a simple example of a single person, but what if you are a single parent and have expenses related to your children, like daycare? It would be even harder to live on minimum wage. I think we can all agree that it’s very difficult to live on minimum wage. And that’s the point that advocates for a minimum wage are making. You can’t live on it, so people on minimum wage have no choice but to ignore paying for things like prescriptions they need, so they get sick, and a much greater burden is placed on the health care system. They have no choice but to turn to high cost debt options to survive. A low minimum wage hurts the person on minimum wage, but it also hurts society. Argument #1: minimum wage laws hurt the very people they are trying to help, because by increasing the cost of wages you will the supply of jobs. If you force a business to pay higher wages, they won’t be able to afford to hire as many employees. Workers might even get laid off, and the only thing worse than a low wage is no wage at all. If a coffee shop must pay its workers 30% more in wages, they will have to increase the price they charge consumers. The same goes for food prices, gas stations, buying goods at Walmart etc. In 2014, 49% of employees aged 15 to 19 years and 15% of those aged 20 to 24 were paid at minimum wage. Among students, 29% were paid at minimum wage, versus 5% of non-students. So about half of all workers between 15 and 19 years old earned minimum wage. Is that a problem? Some experts say no, because a teenager has very little work experience, so earning minimum wage is a good deal for both employer and employee. The employer gets a low-cost worker, and the employee gets a job where they earn money and gain valuable job experience that will help them earn more in the future. The concern is that if you raise the minimum wage, those teenagers won’t be able to find a job, so they won’t get work experience, so they will never be able to earn a higher income. Well, I see both sides of the argument, but I want to discuss a third alternative on today’s show. I think we should consider a third possibility, a different solution that is not often discussed by either side of the debate. This new approach stems from the argument that big corporations are making lots of profit, but they aren’t paying their workers a decent wage. So it’s not a minimum wage issue, it’s a ‘decent’ wage issue. Employers, especially big employers making big profits, should be paying their employees a decent wage. You always hear stories about the big banks, that make lots of money. Canada’s biggest bank, the Royal Bank, earned $10.5 billion in profit in 2016. Other big bank CEOs also earn millions of dollars per year. What does a bank employee earn? A customer service advisor can earn between $24,000 and $44,000 per year. Even if we take the high point of that range, that means the bank’s CEO is earning over 260 times what a regular employee makes. So, the argument goes, a big corporation can afford to pay their rank and file employees more, and they could do it if they would just pay their CEO and top management a bit less. A minimum wage levels the playing field. It forces big companies to share some of their profit with the workers whose work allows them to earn those big profits. But wait. There’s a flaw in this argument. Not all big corporations are paying their employees minimum wage. Some are paying just above minimum wage, so they won’t be impacted by an increase in the minimum wage. That’s why many critics say that it won’t be big corporations that will be impacted by an increase in the minimum wage; it will be small businesses that will be most affected. Let’s assume that you are the operator of a not for profit daycare centre in your community. You realized there was a need for affordable daycare, so you got a local church to agree to let you use their basement during the week, for free. They even agreed to cover all utilities. You found some local companies who agreed to donate food and supplies, so your only significant expense is wages for your staff. They all make minimum wage. Over the next year and a half, the minimum wage is going up by over 30%, and since your only significant operating cost is wages, your costs will be going up by over 30%. Your customers, the parents, can’t afford a 30% increase in what they are paying. They are all typical workers, with typical jobs. They can afford the existing daycare costs, but there’s no way they could afford a 30% increase. According to a recent study by the Canadian Centre for Policy Alternatives, written by David Macdonald, who was a guest on this podcast back on show #114 in November, , the average daycare cost for a preshooler in cities like Kitchener, Markham and Ottawa are around $1,000 per month. In Toronto its $1,150 per month, and in Toronto daycare for an infant costs almost $1,650 per month, and for a toddler it’s $1,375 per month. Let’s use the lower number of $1,000 per month. A 31% increase is $310 per month. If you had your child in daycare, could you afford an increase in daycare fees of over $300 per month? Probably not, which is why you realize that the only way to continue to break even in this daycare centre you are operating is to cut your employee costs. You might be able to raise the fees you charge the parents a bit, but to cover your increased expenses you will need to reduce staff. The math is simple: If you have 10 employees and need to cut costs by 31.5% to pay for the new higher minimum wage, you need to cut 3 employees, and you will still need to raise prices by a bit to break even. Which three employees would you cut? Or do you just tell all of your employees that they can keep their job, but they all have to work 30% less hours? So instead of a 40 hour week, you now only get 28 hours per week? And what about the children? How can you cut 30% of staff hours and still provide the same level of care? Instead of three of the staff taking the kids to the park before lunch, they may have to sit around and watch TV, because that’s easier to do with fewer staff. That’s why critics say that a higher minimum wage does not help anyone. Some staff members either lose their job, or work less hours. The customers either pay higher prices or get less service, or both. That’s the problem with an increase in the minimum wage. Our Joe Debtor study proves that people with lower incomes are more likely to have debt problems, so raising the minimum wage sounds like a no-brainer, but it’s also true that if a business has to pay too much in wages, they can’t employ as many workers. To start, I think we have to make a distinction between big, profitable corporations, like the big banks, and small businesses, like the daycare centre. While a big corporation can probably afford to pay more, a smaller business probably can’t afford to increase wages significantly. So does that mean we should have a different minimum wage for different sizes of business? No, that would be an administrative nightmare. You can’t have the minimum wage changing every time a business hires a new employee. That would just create an extra layer of government bureaucracy, and that can’t be good for employees or taxpayers. And is it fair that the minimum wage is the same in downtown Toronto as it is in a small town where living costs are a lot lower? That’s the problem with a government-legislated minimum wage. In order to be fair, it has to be incredibly complex. Instead of having the government decide how much a business should pay their employees, why not leave it up to the public? How would that work? With a concept called living wage. A living wage is the hourly wage a worker needs to earn to cover their family’s basic expenses within their community. It is calculated based on the needs of a two-parent family with young children, but would also support a family throughout the life cycle so that young adults are not discouraged from having children and older workers have some extra income as they age. In Waterloo Region, the 2017 Living Wage rate is $15.42 an hour. The living wage is different in each community, and that makes sense, because living costs are different. First, it’s different in each community, so it can take into account living costs that vary by city. Second, it’s based on an actual calculation of living costs, not a random round number, like “$15 per hour”, which bears no relation to actual living costs. Third, the calculation is done by an independent third party, not by the government, so the number is more likely to be based on actual costs, and less likely to be based on politics. Fourth, it’s not a law. It’s guidance for employers, employees, and the general public. To me, that’s the most important point. I’m an employer. My company, Hoyes, Michalos & Associates, employs dozens of people. We have 24 offices operating in 24 different communities. How can I, as an employer, know what a living wage is in each town and city I’m in? That’s why a living wage program is very helpful to me as an employer. I know that in Waterloo Region, which includes Kitchener, where our head office is, the living wage for 2017 is $15.42 per hour. It’s higher in some communities, lower in others. So as an employer in Kitchener my goal is to pay my employees at least $15.42 per hour. Here’s the key point: Even after the Ontario government raises the minimum wage to $15 per hour in 18 months, it will still be below the Living Wage today! The minimum wage may help, but it still doesn’t get employees to where they need to be. So the unintended consequence of a minimum wage law is that it pays employees less than a living wage, and gives businesses an excuse for not paying more. That’s why I think all businesses should set a goal for themselves of paying a living wage. That’s what we’ve done at Hoyes Michalos. Hoyes Michalos signed a Living Wage Employer Declaration as a Champion level employer with Living Wage Waterloo Region on March 8, 2017. We have committed to paying a living wage to all of our employees. So that’s great, you say, but what about the small business, like the not for profit daycare centre, that can’t afford to pay $15 per hour, and they certainly can’t afford to pay $15.42 per hour. Isn’t a living wage even worse for them than a minimum wage? A living wage is voluntary, so the business, and their employees, and their customers, have a choice. As a customer, you can decide whether or not you do business with a company that has made a commitment to their employees to pay a Living Wage, or a business that hasn’t. If every consumer decided that they would only deal with Living Wage employers, companies that didn’t pay a living wage would go out of business. So if your big bank doesn’t pay a living wage to their staff, you could decide to take your business to a local credit union. If the big chain grocery store you shop at doesn’t pay a living wage, you could choose to shop at the smaller, local, owner-operated grocery store that does pay a living wage. Perhaps paying a living wage is not possible in some businesses. It may be that a fast food restaurant that employs mostly high school kids can’t pay $15.42 per hour. That’s fine, as a consumer you can decide that you still want to buy a hamburger at that place, because you like hamburgers, and because they are creating jobs for teenagers. It may be that the daycare centre can’t afford $15.42 per hour. Again, it’s up to you as a consumer to decide if you want to deal with that business. Perhaps the daycare centre agrees to pay 90% of the Living Wage, and the clients agree to pay slightly higher fees. As a consumer, you get to decide. Do you want to buy goods that are manufactured in Canada, where the employer paid a Living Wage, or do you want to buy cheaper goods made in China where people work in sweatshops and only make a dollar or two an hour? If as an employee you want to earn a Living Wage, you have to be willing to deal with companies who also pay a Living Wage. If everything you buy is from China, you aren’t creating any jobs in Canada. It’s as simple as that. Only buy stuff manufactured in your home town? What I’m saying is that, as a Licensed Insolvency Trustee, I know that we have an income problem in this country. I don’t believe the government can solve the problem. They may mean well, but I worry that a high minimum wage mandated by any government will backfire, and hurt the people they are trying to help. That’s why I think that we, as consumers, should decide where we spend our money. Check out the businesses you deal with. Search them online. Go talk to the manager. Ask them if they pay a Living Wage. If they don’t, ask why not? Get your friends and family involved. Use social media. You’ve got Facebook friends, use them. If only 10% of a businesses’ customers stopped dealing with that business, that business could be in serious trouble. You don’t need to get every customer to boycott a business. If just a few of you speak up and move your purchasing power, businesses would be forced to change. Do consumers have the power to change what businesses do? I don’t know. We’ve never tried a Living Wage experiment where consumers are actively involved in changing the behaviour of businesses. I’d love to see charities and other organizations like churches and unions getting involved spreading the word. I think it would be a great experiment, and I think it could actually help the people who really need the help, and that’s the working person. So to conclude, I think the solution to our income problem is in all of our hands. I think we can make a difference. But it’s up to us. That’s our special edition of Debt Free in 30 today. 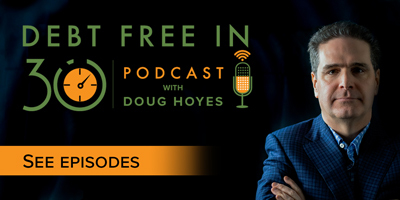 You can leave your comments on Twitter with hashtag #DFI30, or email me at dfi30@hoyes.com, or leave your comments on YouTube or on the show notes page over on hoyes.com. Full show notes, including links to all of the sources I mentioned on today’s show can be found at hoyes.com, that’s hoyes.com. Thanks for listening, and thanks for thinking about this important issue. Until next week, I’m Doug Hoyes, that was Debt Free in 30. How Do I Know If I’m Insolvent? Hoyes Michalos provides residents of Ontario burdened with debt a fresh start. As Licensed Insolvency Trustee (also known as bankruptcy trustees) regulated by Industry Canada, we provide free initial consultations to explain all your debt relief options, including credit counselling, debt settlement, debt consolidation, consumer proposal and personal bankruptcy. © 2019 Hoyes, Michalos & Associates Inc.